This documentary newsreel from Warner-Pathe in 1950 shows, perhaps for the first and only time, some of the newsreel cameramen and reporters behind the stories from around the world wishing everyone Season's Greetings. Documentary filmmakers and reporters include Crawling Hand cinematographer Willard Van der Veer in Hollywood, Chicago sports cameraman Tony Caputo, news producer/director George A. Dorsey with ABC News presidential cameraman Murray Alvey, San Francisco filmmaker Frank W. Vail, granddaughter of Finnish writer Juhani Aho's and author in-her-own-right Claire Aho, and Flipper cinematographer Cliff Poland. The video is 4 minutes and 46 seconds long. The sequence with Claire Aho starts at 2 min. 39 sec. and ends at 2 min. 48 sec. Claire Aho’s career was defined by her pioneering editorial photography and innovative colour techniques. In the early 1950s, at a highpoint in Finnish design culture, Aho (b. 1925, Finland) established a Helsinki-based photography studio under her own name. Her prolific output covered advertising, editorial, reportage and fashion for a range of commercial applications. She dealt with all aspects of the creative process, from casting models, set- making, styling and lighting to developing and printing her own images. The photographs, spanning her career from 1950 to 1970, illustrate Aho’s trademark vibrancy and humour, through formally inventive compositions and scenarios constantly re-imagined. "Her prolific, quality output across a broad range of industries created a demand for her services among leading commercial brands and publications, making her one of the most prominent photographers of the period". "Claire oli omaa luokkaansa ja edellä aikaansa. Hän ei ottanut vaikutteita keneltäkään vaan loi tyylinsä itse", sanoo Clairen luottomalli Carita Järvinen"
Claire Aho on suomalaisen muoti- ja mainoskuvauksen Grand Old Lady. Hänen värikkäissä ja humoristisissa valokuvissaan elää 1950- ja 60-luvun Suomi - viattomuuden aika. Sen muistaa myös huippumalli Carita Järvinen, joka teki yllätysvierailun rakkaan työtoverinsa luokse Tukholmaan. "Carita sai kansainvälisille markkinoille lähdettyään työskennellä maailman kuuluisimpien muotikuvaajien, kuten David Baileyn ja Terence Donovanin kanssa, mutta kukaan heistä ei ole vetänyt vertoja Clairelle". Ever wondered about industrial paper-making processes in 1930s Finland? Then your luck's in. This brief season pays tribute to Finnish brothers Heikki Aho and Björn Soldan and their ability to make any subject look interesting on the big screen. Between 1924 and 1961, they produced around 400 documentaries, chronicling Finnish life with the latest equipment and a refined aesthetic eye informed by European avant garde film-making. As a result, their work still stands up. Best known is Juha, their only feature, a country v city parable based on their father's novel. Also playing are some of their bracingly modern industrial and information shorts, plus films featuring Heikki's daughter Claire (a renowned photographer; her retrospective is on at The Photographer's Gallery) and Splinters, a doc on the whole illustrious Aho-Soldan family. "The photos are from the 1950s to the 1970s and show a mastery of the sparse use of colour and design that we have come to associate with Scandinavia"
Claire Aho’s career is defined by her pioneering editorial photography and innovative colour techniques. In the early 1950s, at a highpoint in Finnish design culture, Aho (b. 1925, Finland) established a Helsinki-based photography studio under her own name. Her prolific output spanned advertising, editorial, reportage and fashion for a range of commercial applications. She dealt with all aspects of the creative process, from casting models, set-making, styling and lighting to developing and printing her own images. "All elements of her photographs point to a modern aesthetic that is ahead of its time: from the use of colour, pattern and form, to the way in which she arranged her subjects and objects in these stylised shots"
"It´s an aesthetic that looks imitative, except that it´s not. This is the stunning work of a true original, rarely seen outside of her homeland. Make sure it´s on your list"
Claire Aho is renowned in her native Finland for (at least) two things: her pioneering fashion editorial photography and her innovative color techniques. Now, as Aho´s 88th birthday approaches, The Photographers´ Gallery celebrate a life through pictures with their lates show Claire Aho: Studio Works. The 1950s were a pinnacle of Finnish design culture. It was in this environment that Aho founded her own photography studio in Helsinki. She photographed for magazines, editoria, reportage, fashion and advertising, dealing with all aspects of the creative process herself: a true auteur, as it were. The pictures on display at The Photographers´ Gallery demonstrate some of the finest of Aho´s trademark work, and we see evidence of symmetry, use of block colour and exquisite framing and cropping. It´s an aesthetic that looks imitative, except that it´s not. This is the stunning work of a true original, rarely seen outside of her homeland. Make sure it´s on your list. Claire Aho: Studio Works is at The Photographers´ Gallery until 21 July. "Now it is possible to see Aho’s magnificent works at The Photographers’ Gallery in London"
Claire Aho, 87, is considered the pioneer of Finnish editorial photography. Now it is possible to see Aho’s magnificent works at The Photographers’ Gallery in London. The exhibition focuses on Aho’s studio works from 1950s till 1970s. Aho was born in Finland in 1925 and got her first camera at the age of ten. This very talented, visionary woman is a grand daughter of another two talented Finnish artists: famous writer Juhani Aho and painter Venny Soldan-Brofeldt. Aho started her career in 1940s. She was known as a very innovative photographer and the colorful, lively and sometimes even amusing poses she captured were new in the field of editorial photographing at the time. Not to mention the fact that the photographer was a woman. Most of her works Aho did for leading Finnish lifestyle magazines, such as Suomen Kuvalehti and Avotakka. Aho currently lives in Stockholm, Sweden. She’s retired but still continues photographing. Claire Aho: Studio Works exhibition is available at The Photographers’ Gallery until 21st of July.
" --- the composition of the various scenarios is extremely inventive"
"The focal dynamism and balance of the composition, taken with the intensity of the colour, grabs the attention of the viewer"
"--- Aho employs ingenious methods for displaying complex, patterned materials with extra geometrical complexity"
Claire Aho has produced a prolific output, covering editorial, advertising, fashion photography and reportage. From this substantial body of work the selection of photographs exhibited at The Photographers’ Gallery were taken between 1950 and the late 1960s. In the early 1950s, Aho opened a commercial studio in Helsinki. Here she undertook every aspect of the image making process: casting, styling, lighting and developing. This exhibition focuses on her studio work. When inherited feelings about culture and commerce in those with an industrial heritage are put aside, the composition of the various scenarios is extremely inventive. These compositions when considered outside a commercial context at least hint at the surreal, especially taking into consideration the form of the compositions. An almost overwhelming continuity throughout the work is the intensity of colour. Another is the arrangement of pattern. Use of intense colour is exemplified in Untitled. (c. mid 1950s) – a photograph that focuses on a bunch of flowers. Pink and purple here are so intense that they glow against the plain background. Owing to this intensity, the entire composition has an unreal quality. This hints at three qualities imparted by all of the work on display: health, opulence and elegance. Paula Coffee and Erikois Beer (c. mid 1950s) speak of these qualities through the use of intense colour and the beauty of the models. Particularly striking here is the form of the compositions, which is finely balanced. Against black backgrounds the female models are captured from surprising but balanced angles holding trays with the items advertised. Intense colour and female beauty impart unreal health, opulence and elegance in Untitled (1960). Here, a female model looks directly to camera. She wears an elegant, aquamarine ball gown. She seems to be situated in a forest. Here, the unlikely nature of the situation coupled with the intense colour generates the unreal opulence desired. The same intensity of colour is employed to impart opulence in the photographs in which items of food are captured. In National Eggs at Breakfast campaign (c. mid 1960s) the form of the composition is most striking. A dinner gong stands on the table top in focus and in the foreground to the left. Out of focus, in the background and to the right stands an egg in a cup and crockery on a placemat. The focal dynamism and balance of the composition, taken with the intensity of the colour, grabs the attention of the viewer. Valio Ice Cream (c. late 1950s) features four photographs of ice cream sweets. Again, the use of intense colour seems to make sweets glow with unreal perfection. In From Cotton Rhapsody catalogue images (1958), Aho employs ingenious methods for displaying complex, patterned materials with extra geometrical complexity. The use of striped material, both in garments, and then as interrelated visual context, comes across with balance and grace. Such comes from the arrangement of the compositions. Outside of this fashion catalogue, this method is employed to the effect of fascination in Fayer Chocolate (c. early 1960s). Here, a female model is shown wearing a black and white striped dress with elegance. She is seated and holds up a wrapped chocolate bar, the wrapping of which is of similar black and white stripes. The unnatural, unreal uniformity of the pattern in both cases is balanced by the curvature of the human form. Claire Aho: Studio Works, until 21 July, The Photographer’s Gallery, 16 – 18 Ramillies Street, London W1F 7LW. "She is particularly admired for her work with pattern, form and colour and the dialogue she creates between them in her images"
"The clinical, yet adoring minimalism brings to mind Irving Penn advertising photography for Clinique, which he began later on in the same decade". "Aho disorders the traditional passive glamour shot with visuals echoing Horst P. Horst’s famous corsets and disembodied limbs". This exhibition explores the early career of Claire Aho (born 1925 in Finland), focusing on her work from 1950 to 1970. Aho established herself as a successful photographer during a period when new design culture was flourishing after the ravages of the war. She pioneered the use of colour photography, made films and worked as a film reporter for Warner Bros. The exhibition is a combination of original magazines and studio photography for adverts and publications. In her studio work, Aho had complete creative control, taking responsibility for all aspects of image creation, including model casting, sets, lights, styling and printing the pictures. Although this is considerably more than the equivalent photographers would perhaps undertake today, it is worth remembering that the other, related professions such as stylists are relatively new. Former models tell stories of doing their own make up and bringing their own clothes to shoots during the 1960s. The initial impression of this exhibition is one of rosy nostalgia, with pretty full-skirted models posing among pastel colours. A closer look reveals more modern approach, playful and at times almost edgy in its use of the studio space. Unlike the stiff mannequins of the 1940s and early 1950s, the relaxed models seem like contemporary girls. The exhibition certainly demonstrates Aho’s incredible use of colour: typical 50s pastel shades are punctuated by Technicolor cerise, turquoise and mustard yellow. The models’ make up forms a part of this colour palette with bright blue eyes contrasting with poppy red lips. Around the edges, the traditional studio set ups are disrupted by paint pots and studio lights, the visible image-making equipment drawing attention to the artificiality of the image and the creative process behind it. These are more than just quirky touches, as they disrupt the conventional images being created. Adverts for coffee, fabrics, beer, chocolate and the less glamorous tinned meats encapsulate the new, emerging post-war culture. Aho’s advert for a fridge shows an American-style one, filled to the brim with meats, vegetables and Coca-Cola, suggests a new aspirational consumerism, particularly notable as food rationing in Finland had only ended completely in 1954. Some of the product shots are organised into formal still lives, for example the advert for Stainless Finland (c. mid-1960s) which shows a neatly ordered set of gleaming cutlery, almost fetishised as objects of desire. The clinical, yet adoring minimalism brings to mind Irving Penn advertising photography for Clinique, which he began later on in the same decade. Elsewhere, an undercurrent of Surrealism emerges. A model on a magazine cover turns into a giant posing next to a tiny doll’s house chair. A mid-1950s advertising campaign for Figura, with the strapline “Be Younger than Yesterday”, fills a corset with ripe red roses, instead of the female body. When the model is shown, her head is cut off and she is stretching away from the camera’s gaze. Aho disorders the traditional passive glamour shot with visuals echoing Horst P. Horst’s famous corsets and disembodied limbs. Aho’s light touch belies her skill and thought behind the image-making practice. Perhaps an apt comparison to her advertising imagery is the old Hollywood studio system, where dynamic creativity flourished under strict, commercial briefs. The boundaries of Aho’s commissions were stretched – and surpassed – by her innovative imagination. "She had been taking pictures ever since her father gave her a camera aged 10, when she would gain an understanding of composition by snapping her granny's paintings. "Her colour work was at the forefront of Finnish photography, and often used humour to bring her scenes to life..."
"Claire Ahon suuri lahja oli tehdä tavalliset tilaustyöt niin, että ne jäivät kiinni aikaan ja muuttuivat samalla todisteiksi, kulttuuriksi ja historiaksi"
Who would have thought that I could enjoy a flash back in time to my childhood years during a Saturday afternoon stroll through London’s Soho? “Claire Aho: Studio Works” is the first solo exhibition by the Finnish photographer and is placed in the newly revamped Photographers’ Gallery, just seconds away from the hustle and bustle of Oxford Circus. There I found, staring in front of my eyes, an array of colourful pictures by Claire Aho, who is, you could even say, a Finnish cultural icon. Strangely familiar settings of children’s tea party next to a compression refrigerator UPO, magazine covers from lifestyle publications such as “Me Naiset” and “Viikko” and commercials showcasing Finnish soft drink Jaffa or chocolate brand Fazer. These images from outfits to brands to moods are so ingrained in my memory that it’s almost scary. At the same time, I can’t stop smiling at the innocence of these photographs in comparison to the commercial shots of today. Claire Aho’s work portrays in pastel colour settings how economic and technological upheaval took over the small backward country of Finland, and turned its citizens to models of modernism. Happy smiley faces reflect in the pictures optimism and content derived from consumerism. In my opinion the exhibition provides an interesting snapshot to the history of Finland for those interested. It is on show until 30 June 2013 and it’s free, so perhaps worth a visit for you too. "Suomalaisen värivalokuvan mestari Claire Aho Lontoossa"
Lontoon Photographers' Galleryssä on esillä suomalaisen valokuvaajan ja värivalokuvauksen uranuurtajan Claire Ahon ensimmäinen yksityisnäyttely 19.4.-21.7.2013. 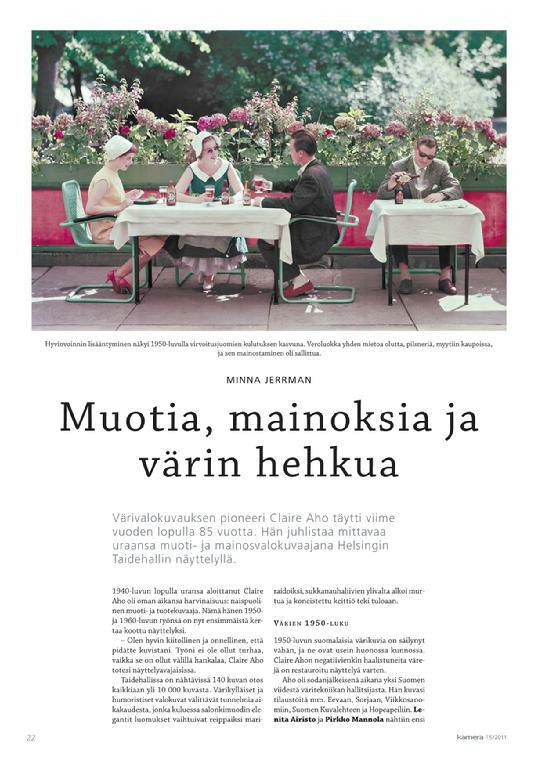 Kekseliäänä ja vahvana Suomi-brändin rakentajana tunnetun valokuvataiteilijan näyttely koostuu lehti-, mainos- ja muotikuvatuotannosta vuosilta 1950-70. Ahon edelleen ajankohtaiset ja inspiroivat työt, ikoniset kansikuvat ja mainoskampanjat kertovat tarinoita värikkäästä ja leikkimielisestä Suomesta. "Claire Aho's pioneering vision and innovative approach to colour re-energized editorial and fashion photography in Europe during the mid-50s and late ’60s"
The Photographers’ Gallery, London presents ‘Claire Aho: Studio Works’, the first solo international showcase of Aho’s photographs. She is a pioneer of Finnish colour photography and a key cultural figure in her homeland. This exhibition will focus on Aho’s 1950–70 studio-based works, displaying images from the world of advertising, editorial and fashion, alongside original Finnish lifestyle magazines featuring her cover pictures. Brightly coloured, formally inventive and full of wit, Claire Aho’s photographs capture a distinctive era in Finland’s history while maintaining contemporary vitality and relevance. Aho started her career as a documentary filmmaker before eventually setting up her own commercial studio in the 1950s – a formative time in Finnish design. Whether capturing her models in amusing poses or meticulously composing still-life scenes, Aho’s cutting-edge approach to image making was a reflection of the bold and lively atmosphere prevalent in the creative sector in Helsinki at the time. Her prolific, quality output across a broad range of industries created a demand for her services among leading commercial brands and publications, making her one of the most prominent photographers of the period. While running her own studio, Aho remained in complete control of the space, commanding every stage of the production from casting, styling and construction of sets to liaising with designers, manufacturers, magazines and advertising agencies. This exhibition will look at Aho’s inventive working methods and practices within the studio environment as well as her relationship with the models, objects, forms and patterns depicted. Photographs will be hung in loosely themed groups complemented by vintage publications, placing them in the broader context of how they were disseminated and used. Occasional glimpses in the pictures of the machinations of the studio – lighting gear, colour charts, the casual artist portrait –will further enhance the photograph’s journey from initial conception to its various commercial applications. We are delighted to be able to introduce the work of Claire Aho to a new audience outside her native Finland. Claire Aho's pioneering vision and innovative approach to colour re-energized editorial and fashion photography in Europe during the mid-50s and late ’60s. Her work resonates with contemporary artists such as Roe Ethridge, Michele Abeles, Owen Kydd and Bryan Dooley, whose staging of the image serves to re-examine the language of editorial and advertising photography. "I could see shades of Cindy Sherman’s ideology in Aho’s image construction – or that should probably be the other way around"
Dazzling colours, a touch of kitsch and playful use of patterns are the hallmarks of Finnish photographer Claire Aho. It takes you back to the days when there was a sweetness and gentleness to photography, and in particular, the advertising world. This is not a harsh assault on the senses a la the brutalist movement. Rather, there’s a deftness of touch, particularly in the first image of the show – a simple bunch of flowers. But look again and you see it’s riot of colour, a vivid arrangement in which the reds, pinks and deep purple tones sing out. A rose on the left turns its head from the bunch, a rogue bloom that is striking in profile. The Photographers’ Gallery exhibition focuses on Aho’s studio-based work in the areas of advertising, fashion, editorial photography and magazine covers. Aho has had a unique career. She was hired by Warner Pathe News, New York, as the only female photographer among 400 men, and she was practically the only woman photographer working in the commercial sector during the 1950s and 1960s. When I chatted with her after seeing the show, I asked if she felt there was a reason why she was the only woman photographer at the time. She just shook her head and shrugged her shoulders. She just refuses to see any difference between herself and other photographers because of her gender. And yet I can sense a difference. What I see in the images is a sense of humour; the woman is aware of being the object of the gaze – the model meets your gaze with a wry look, as if to say, ‘Yes, this is really a strange thing to be doing, holding up a typewriter like its a tea tray. ’I could see shades of Cindy Sherman’s ideology in Aho’s image construction – or that should probably be the other way around. The models look slightly ill at ease, with splayed out legs as if they have been caught in awkward poses. If you’ve ever tried to replicate a Cindy Sherman pose (as I have, and don’t ask why), it’s really very uncomfortable and painful to hold for longer than a few seconds. But the poses do look good. Because they are not natural poses, they catch the viewer’s eye and you need to stop and look to figure out what’s odd about the composition. What Aho does is very difficult to achieve. She brings together a sense of mischief, fun, and surrealism as well as authenticity to her images. There’s a marvellous image of a buxom redhead in an emerald green sweater, with her breasts proudly standing out, which is more to do with upholstery than breast implants. Once you tear your eyes off her breasts, your eyes are drawn to the equally prominent bottle of Erikois beer – which is the selling point of the image. Beer and breasts – a double whammy you just can’t beat. Now a sprightly 88, Aho is in demand and receiving the recognition as a pioneering photographer she richly deserves. She is giving a talk on Saturday 20 April and there are screenings of her documentary films on 24, 25, 26 & 29 May at the ICA.Claire Aho: Studio Works is at the Photographers’ Gallery until 21 July 2013. Claire Aho's solo exhibition features photographs spanning her career from 1950 to 1970, with her trademark vibrancy and humour. "A solo show of vintage studio photographs by the Finnish commercial photographer Claire Aho manages to seem considerably more modern with her masterful manipulation of colour in the name of advertising"
"Her inspired layering of fabrics and backdrops and her talent for bringing out a model’s personality are still being emulated today"
"If colour is thematic in the work of Aho, so is humour and audiences will definitely get a sense of that at the show"
Artist Claire Aho began her career as a photographer during a time when men dominated the industry. A cultural icon in her native Finland, British audiences now have the chance to see the images that made Aho’s name at London’s Photographers’ Gallery. The exhibition concentrates on Aho’s career from 1950 to 1970 – a period where her use of colour and inventive style made her a leading name in the world of advertising, editorial and fashion photography. Studio Works is the first solo exhibition of Aho’s work in the UK and will include the original Finnish lifestyle magazines featuring Aho’s cover pictures, as well as images from her archive. Considered a pioneer of Finnish colour photography, Aho started her career in film before establishing her own commercial studio in the 1950s. Aho’s photographs from this era depicted domestic life around Finland and many of these images will be on view. Aho’s pictures are saturated with colour and contrasting palettes usually appear side by side. It was the quality of Aho’s colour photography that created a commercial demand for her services across a range of industries. If colour is thematic in the work of Aho, so is humour and audiences will definitely get a sense of that at the show. Photographs such as Compressor Refrigerator, which depicts a children’s tea party wouldn’t feel out of place in a current ad run for Ikea. The fun and playful quality that underscores much of Aho’s images at the show should connect with audiences. Claire Aho says she never saw her work as pioneering during the 1950s, she ‘just worked hard’. But you need only watch the travails of Peggy Olson from the fictional show Mad Men to realise just how hard that must have been. "It seems unheard of: a female photographer (of fashion & advertising) during the 50's"
It seems unheard of: a female photographer (of fashion & advertising) during the 50's. If you're around, it's definitely worth a peek. Claire Aho: Studio Works is on until 21 July. "The elements of movements and color are part of what make her work iconic"
Claire Aho worked as a photographer during an age when the advertising and photography world was dominated by men, as depicted in the popular TV show "Mad Men" "They are ively. Alive!" photographer Claire Aho says about her photographs. Aho is considered a pioneer in Finnish color photography. She started taking photos in 1935 at age 10, following in the footsteps of her father, Heikki Aho, a renowned Finnish filmmaker. She was one of a very few women who were producing color photos in the 1950s in Finland. "I believe I was the first female photographer who photographed in color", she tells CNN. She worked as a photographer during an age when teh advertising and photography world was dominated by men, as depicted in the current popular television show, "Mad Men". "In the 1950s I never thoufht I did pioneering work. I just worked hard" she says. "The expression "pioneer" was affixed to me lager". Aho´s work runs the gamut from magazine and editorial images to advertisements and fashion. This breadth of high-quality color photography put her in high demand, making her one of the most prominent figures in her field at the time. The elements of movements and color are part of what make her work iconic. She, like her father, began her career as a documentary filmmaker. "Many of my photographs include an element of movement" she says. A daring exploration of color is thematic in Aho´s work, with a preference of contrasting colors side by side, and the hopes of displaying the idea of her "inner eye". She makes the camera work for her to get the perfect look. For her photo shoots she often played music to help the models relax and aimed to create a fund and playful environment. "I look for those expressions which seem to be very characteristic for (the subjects), and try to take the photo at the exactly right moment". In her commercial work, she tried to portray women as strong and independent, with models posing in elegant and fashionable clothes. Aho looked to create a humoruous and a positive mindset in each photo. The models believed she could take a good photo of them and it shows in her work, she says. Two of her grandchildren, ages 5 and 7, seem to have creative traits and may follow in her footsteps into photography. The exhibition of her photos at The Photographers´ Gallery in London will open on April 19. Deutsche Börse & Aho - The Photographers´ Gallery, featuring Finnish artist Claire Aho, presents the much awaited Deutsche Börse Photography Prize 2013. "Her innovative approach to color and inventive style have made her a leading name in the world of advertising, fashion and editorial, areas on which the exhibition focuses on"
The second exhibition the Photographer’s Gallery is proud to present the studio works of renowned Finnish filmmaker and photographer Claire Aho. A key cultural figure in her homeland, she is one of the pioneers of Finnish color photography, and as the only female cinematographer in her field, filmed the 1952 Olympics. Having sold her first photograph at age 15, she was later on hired by Warner Pathé News, New York as the only female photographer among 400 men. Her innovative approach to color and inventive style have made her a leading name in the world of advertising, fashion and editorial, areas on which the exhibition focuses on. KAMERA-LEHTI 5 2011 CLICK TO OPEN!